"Dirty Shirt's Romanians have found a balance between whiteness and darkness with a dizzying schizophrenic recipe for industrial folk metal." These Romanians are crazy! Since 2010, from "Very Dirt" (2000) to "Dirtylicious" (2015), "Same Shirt Different Day" (2010) and "Freak Show" (2013), Dirty Shirt has distinguished itself by its mix of colors working in a dark whiteness (or a white darkness?). The heavy tremors specific to industrial metal are often rocked by folk elements in the great Balkan tradition. For their 5th studio album, the Romanians don't deviate much from their formula. As its name does not indicate, the letcho is a traditional Hungarian dish that comes close to our ratatouille. To make their own, Dirty Shirts need two main ingredients: a large metal spoon and a folk sauce that adds a lot of spice to the whole. The guitar produces electric sparks ('Hora Lenta' which evokes Dream Theater ,'Killing Spree' and its raging riff, 'Put It On' and its neo-metal introduction), the drummer slams mercilessly on his toms, a deep voice from beyond the grave grabs the microphone and despite its heaviness, flies over our heads. Growls are not too much ('Put It On','Fake') in these hallucinated sound paintings. As said, Romanians are adepts of sound mixing. First of all, Dan 'Rini' Craciun's orientalizing punk voice, quite androgynous, brings a mysterious quasi-sensual added value that goes well with the song of a Transylvanian woodcutter ('Nem Loptam'). The heavy rhythms coexist in harmony with this Balkan folk music (we obviously think of Goran Bregovic). Latcho Drom' looks like a caravan of the strange; 'Palinca' and its festive screams and choirs look like a nightmare, as if a smart guy had had fun changing the reading speed of a traditional song or even mixing two different concerts; 'Fake' plays symmetries between a folk verse and an explosive chorus in the same lineage as Diablo Swing Orchestra. And the listener didn't see everything: 'Hora Lenta' and its volcanic atmosphere punctuated by generous growls is fanned by an accordion! A few pieces tend to make us lose catches. After a unifying chorus (I challenge anyone not to bellow it in harmony), "Killing Spree" embarks on an improvisation. Nice Song' raises the water before finding a little peace of mind with a piano. The last piece,'Starea Niatiei', brings some jazz touches, still these Balkan violins, and then ends with a children's choir. However, we would have liked the band to flesh out these brackets a little more. Dirty Shirt's Romanians have found a balance between whiteness and darkness with a dizzying schizophrenic recipe for industrial folk metal! Feel free to push the door of this house that will drive you crazy. 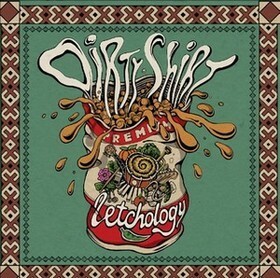 Avec "Letchology" , Dirty Shirt prouve qu'il est passé maître dans la science de la ratatouille et nous balance un album qui figurera dans bon nombre de top de l'année à qui aura osé poser une oreille curieuse sur cet OMNI totalement addictif ! Dirty Shirt's Romanians have found a balance between whiteness and darkness with a dizzying schizophrenic recipe for industrial folk metal.